(a) What is the power output in watts and horsepower of a 70.0-kg sprinter who accelerates from rest to 10.0 m/s in 3.00 s? (b) Considering the amount of power generated, do you think a well-trained athlete could do this repetitively for long periods of time? b) Probably not, since a human is much less powerful than a horse. This is College Physics Answers with Shaun Dychko. The power output of this sprinter is the work that they do divided by time. The work that they do is the net work and so it is the change in kinetic energy in other words then, divided by time. We know that the work that the sprinter does is the net work because there is only one force horizontally on the sprinter and so that makes it the net work. 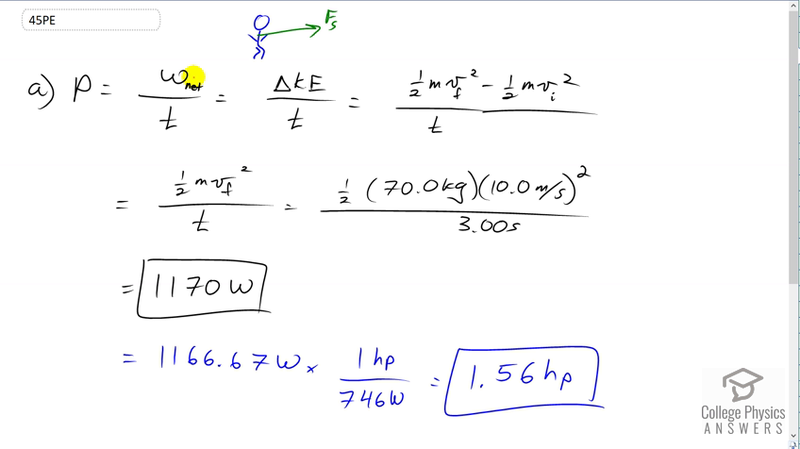 So the change in kinetic energy is one half mass times the final speed squared, minus one half mass times initial speed squared, but they start from rest and so this reduces to just this. So the power is one half times 70 kilograms times ten meters per second squared, divided by three seconds which gives 1170 watts. We can convert that into horsepower by dividing by 746 and then we get 1.56 horsepower. It's unlikely that the sprinter could keep this up for very long because a human is less powerful than a horse. The current power output is one and a half horses and so they probably can't do that for very long.